$1 Billion Dollars in Verdicts and Settlements | Hupy and Abraham, S.C.
Hupy and Abraham, S.C. has collected more than $1 billion in verdicts and settlements on behalf of the thousands of injured clients it has represented. Few personal injury firms in the Midwest have done this. As the president of Hupy and Abraham, S.C., Attorney Michael Hupy has built the largest personal injury law firm in the state of Wisconsin that has expanded to 11 offices in three states with close to 200 employees. Attorney Hupy has exclusively practiced personal injury law for several decades, and has recovered many multi-million dollar cases, including a $9,500,000 slip and fall case, which was the largest slip and fall case verdict at the time, to be paid out as a $22 million structured settlement. After joining the firm in 1993, Hupy and Abraham, S.C. Attorney Jason Abraham became a shareholder in 1999. Shortly after, he became Managing Partner and the firm became Hupy and Abraham. As a personal injury litigator, Attorney Abraham has settled or received over $350 million for his clients nationwide, including the landmark Milwaukee police brutality case that resulted in his client becoming a quadriplegic, and being awarded $3 million. Hupy and Abraham received the highest rating that recipients of the Martindale-Hubbell award can receive -- AV Preeminent for ethical standards and legal ability. The firm is a member of the Association of Trial Lawyers of America and received a 2015 Litigator award for outstanding legal representation in the “Dangerous Conditions: Slip and Fall” category. The firm has conducted many campaigns to raise safety awareness including Yield to Pedestrians, “DNT TXT N DRV” and Watch for Motorcycles. Over 100,000 bumper stickers and promotional items have been distributed in support of these campaigns, which have also been viewed over 10 million times nationwide. For more than 50 years, Hupy and Abraham, S.C. has provided top-notch legal services to clients in the Midwest. 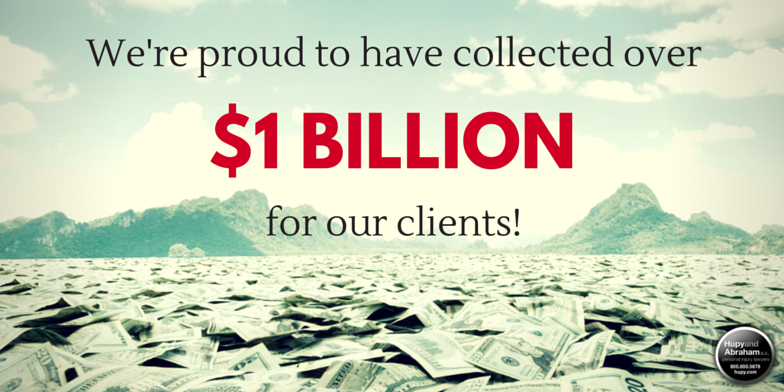 Moving forward, the firm will continue its high level of legal service for each client, surpassing $1 billion in verdicts and settlements, which speaks to the quality of service and representation Hupy and Abraham, S.C. gives.